While I got the opportunity to travel down to Guwahati and savour some wonderful Assamese delicacies at Gam’s Delicacy, Paradise, this time I got an opportunity to stay in Tezpur, Assam for a almost two weeks. The University Guest House in the sprawling Tezpur University Campus offered home cooked food but a friend and colleague A introduced us to his friend Neelam who runs an organic farm. He had come to the University to collect some seeds from our friend. Not only did we kept a handful of lettuce and other greens to prepare salad with our meals , we ( a group of three enthusiasts) lapped the opportunity to spend a night at Pabhoi Greens. After a hectic day we escaped from Tezpur to explore Pabhoi Greens. As the driver navigated the narrow roads one could see a silhouette of tea plants guiding us along the road on our way to Pabhoi. It was pitch dark and with half sleepy eyes we could imagine the green cascade of plants that welcomed us when you reached Pabhoi. As the driver parked the car a group of 6 dogs welcomed us. Neelam (the owner) came down with a miner’s torch and led us to the portico facing two large water tanks. We glided into the comfort of the bamboo chair and sipped Assam Tea, chuckled at the sight of fireflies and soaked ourselves in the silence of the night. The dinner beckoned us to shift to the dining hall where Manju didi had cooked a spread for us. As we entered the salad spread sitting pretty with organic farm greens was particularly exciting. The Bengali soul in me wanted to have as much Kagchi/ Gandharaj Lebu ( a variety of lemon). 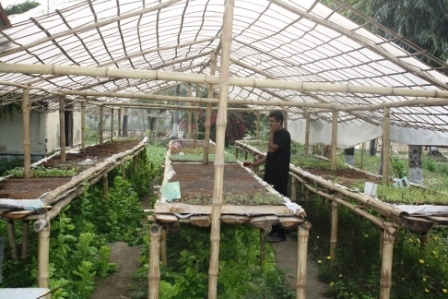 The salad spread was prepared of handpicked greens and vegetables from the farm. As we made our way through the salad the piping hot Joha Rice (a local variety of rice) was served to us, followed by pulses, mixed vegetables. The stars of the meal were Maasor Tenga and Fried Chicken. The taste of the freshly caught fish is something that you crave when you stay in a city which has polluted its river beyond rescue. Fish Tenga as you might know is a sour gravy prepared of tomatoes and because of its sour taste it is called tenga( Assamese word for sour). For all those who want to prepare this Assamese delicacy take a look at the detailed step by step post by Ruprekha on Fish Tenga (http://rupascloset.blogspot.in/2011/04/assamese-delicacies-8maasor-tenga.html?showComment=1365188708469#c1848959286321035958). This was followed by Fried Chicken. After our dinner spread Neelam took us around the farm. He introduced us to the youngest member in the cattle-shed- Daisy who wanted to break her shackles and prance round. Babu the head of the family was sober and exuded much of an interest with H. As we were lazying around, we spotted an owl and Neelam showed us how the “well” functioned as a treatment site for the poisonous snakes. We decided to call it a day as Neelam shared anecdotes from trainings he organised for students pursuing their studies on agriculture and his trails across North East. While A asked him to show us the pictures from his previous tours, I snuggled in the comforts of the pillow with a vivid image of a bright orange butterfly with black dotes. Realising that we have decided to call it a day, A and Neelam retired to their dens. The pitter patter sounds of the rain on the rooftop followed in an hour later with the whistling sounds of the storm. While my mind ached to sit and soak the rain kissed night my body ached for some sleep. Giving way to temptation I woke up to a bright day. H had already taken a tour of the farm and AI was getting ready as well. Neelam gave us a guided tour of the shades where varieties of tomatoes, greens were waiting to be transferred to the field. He told of us the various training sessions he was planning to organise with students across universities. He also showed us the eco-hatch project he had initiated few years ago. It was time to bid adieu to Pabhoi and head back for Tezpur after a nice creamy rich homemade curd and some toasts. I am hoping Neelam kicks of a home stay project soon so that itiriti readers could also have a taste of organic produce. Contact for further details : Neelam Dutta, Pabhoi, Biswanath Charali, ASSAM. 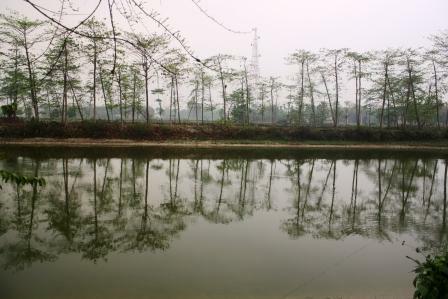 Photos by Amiya Kumar Das.